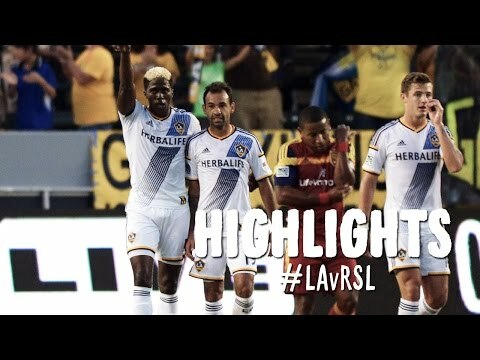 Published: July 14, 2014 11:20 am Updated: July 14, 2014 12:01 p.m.
Real Salt Lake found L.A. Galaxy a formidable opponent with a 1-0 loss on Saturday, preventing what could have been an exciting sweep of a side RSL has so often fought for plaudits. Ratings are 1-10 and represent a general sense of each player's performance. Nick Rimando, 8, had a strange but effective game. He was forced to deal with Landon Donovan on the counter once and did well, and he spectacularly saved a penalty right at the death. His mentality was again excellent, saving the penalty after taking a kick upside the head when it was probably easier to just give up on the play. But for a bounce off the post that ended in a goal, he’d have a clean sheet to his name. Tony Beltran, 6.5, was good but relatively untested on the right flank. His passing wasn’t top-notch — or perhaps quite at his standard — but he did work toward some creative play that could have helped. It’s not that it’s the thought that counts, but attempting to be creative deserves recognition, even if a deep L.A. Galaxy back line was stymieing in the second half. Nat Borchers, 7, won four interceptions and recovered the ball in good positions; there wasn’t much he or the back line in general could do about the goal. Chris Schuler, 7, picked up play in strong spots and pushed the ball forward to the midfield well. Chris Wingert, 6.5, was an important connective piece, as he usually is, but wasn’t spectacular. Kyle Beckerman, 8, was probably the most important attacking player on the night, which says some interesting things about RSL’s play in general. Given that he took more shots than any of his teammates, there should be questions about RSL's play, but he was quite good. John Stertzer, 6.5, had another solid start but faded a bit as the match wore on. He was substituted out for the equally ineffective Luke Mulholland, but two shots from the previously unknown-quantity Stertzer were enough to give hope for the future. Luis Gil, 6, came out at the half for Ned Grabavoy, but it wasn’t for having a poor match. He will want to get into a better shooting rhythm, but he played a good midfield role when the Galaxy afforded him space. Javier Morales, 7.5, was everywhere, creative and controlled. His role, in which he plays essentially across the attacking third between the forwards and the deeper midfield players, is important, and few players are capable of the control he exhibits. Devon Sandoval, 5, didn’t take a single shot, complete a key pass, or do much inside the box aside from pass back outside it. It was not his best match by some distance, and he’ll want to improve on it. Joao Plata, 6.5, had some exciting moments of attack and managed a few shots. On another day, maybe he'd score one of those and it would be an entirely different story being written. Ned Grabavoy, 6.5, came into the match as L.A. Galaxy shifted in strategy. While he wasn’t decisive, he played about where we’d expect him to play week-in, week-out. Luke Mulholland, 5, was anything but the exciting player we saw at the beginning of the season. His play was excessively deep in the midfield, his movement was generally lacking, and he never really throated. Olmes Garcia, 5, failed to really get into the match, despite general pushing in attack from Jeff Cassar’s side. Matt Montgomery is the managing editor of RSL Soapbox. Contact him at [email protected].